1) Conversion of a number represented as a string type into an integer type. For step 1: Use the standard library function stoi. It does what you might imagine, extracts the numerical data from the string and stores it in an integer. Now you have the number as an integer. 1) This process involves the conversion of a number from base 10 (decimal) to base 2 (binary). 2) Divide the number by 2. 3) Store the remainder and the quotient of this division operation for further use. 4) The remainder becomes part of the binary representation, while the quotient is used as the next dividend. 5) This process repeats until the dividend becomes 1, at which point it too is included in the binary representation. 6) Reverse the string, and voila! You now have the binary representation of a number. 7) If you want to handle negative numbers (which I imagine you might), simply perform a check before the conversion to see if the converted integer is negative, and set a flag to true if it is. 8) Check this flag before reversing, and add a negative sign to end of the string before reversing. Games you should play to learn from as a designer. Like the title says, these are games which I believe have much educational value to game designers, as they are sterling examples of design done right. Some suggestions are primarily RPG based as I am someone who plays RPGs a lot. 1) Any Forgotten Realms CRPG from Black Isle such as Baldurs’ Gate 1/2, Planescape : Torment etc. These games are a masterclass in how to provide narrative and emergent gameplay without overloading the character with too much information. Even for someone completely unfamiliar with D&D as a whole, the story is intriguing enough for a newcomer to wish to find out more, without being entirely swamped in unfamiliar context and feeling frustrated for not knowing enough. Pro-tip : Planescape : Torment was one of the first games (that I can recall and have played at the very least) that used death as a gameplay mechanic and plot point that tied into the characters backstory as opposed to an obstacle that forced a reload. It also revolves entirely around the exploration of a single, very profound question. 2) Any Elder Scrolls game, in particular Morrowind and Skyrim, but for very different reasons. Morrowind was revolutionary at the moment of its release for presenting a completely open world experience where your character, despite being the ‘Chosen One’ (i.e. the Nerevar) who must save the world, had the option of choosing to ditch the main storyline completely in favor of pursuing other goals and interests, and just generally faffing about in the world. The reasons for both of these things? 1) Support for mods, which are player made alterations/additions to the game. 2) A very well defined gameworld with established lore and races, which does a LOT for immersion and the feeling of emergent gameplay, this applies more to Morrowind in particular (in my opinion) than to Skyrim, as I feel Bethesda sort of went off the rails with Skyrim and aimed for too large a game, while not having enough content to make the game world feel alive. This is only in the vanilla (unmodded) version however, as there are an ample number of mods that make the world of Skyrim come to life. Pro – tip: You want to know how to not ever start a game, look at the intro cinematic for Skyrim. It’s dull, colorless and generally irritating enough to the point that people have developed mods to skip this bit entirely. Made by CDProjektRed, these games are an inspiration to every independent developer as they exhibit how a bunch of video game fans can actually just get together with no idea of how to make a game worthy of AAA quality, and just do it, with class and precision. 1) Creating a world that is not so black and white, but rather defined by shades of gray. Where the actions of your character are not always the heroic or best option, but just the only option that seems possible to choose, given your mindset and character as a human being. These games have so much depth in how they allow you to examine the human condition it is simply incredible. Unlike the Tolkienesque ideal of a fantasy world where everyone who is good is always honorable and right, and their actions can never be doubted once committed to, and evil is always horrible, monstrous and doomed to fail, the Witcher games are ostensibly about killing monsters, but that is only a sideline to showing us that often, the only monsters that have ever existed are human beings. What you thought was the best option, for instance, agreeing to search for the wife and daughter of a man who has information you need, only to find out that the very same man is a drunken wife-beater who caused his wife to suffer a miscarriage, which is why her and her daughter fled in the first place, you begin to wonder as to the point of it all. This is game design at its absolute best. It showcases the human condition, and makes you wonder at the nature of it. Geralt is not an infallible paragon of virtue. He can make mistakes. He’s not the ideal person, but he IS an actual person. This allows empathy and understanding of motivation, which goes a great deal towards immersion. 2) Making you feel the weight of your actions with definite consequences. The world of the Witcher is not in the least bit static or unchanging. Often times the decisions you make can affect the lives of individuals or entire communities. Choosing to save a village from an onslaught of monsters, or having the decision to simply walk away and leave them to their plight, it empowers the player in an entirely different and superior way than to force them to always do ‘What is right’ and expected of them. There are no right decisions in the Witcher. There are only actions, and their consequences. Pro tip: The first game was a bit rough-shod in its handling of how Geralt could acquire cards of the women he slept with, which I’ll admit was tasteless and derogatory to women by somehow making them out to be something as simple as possessions to be owned, but they have matured greatly with time and experience. Another epic maker of RPGs with a focus on combat as opposed to story (at first glance), From Software have perfected the art of telling a story without the need for handholding the player from start to finish. Any player of these games would tell you right away, that the single most interesting thing about these games, is the world in which they are set. Be it Drangleic, Lordran or Boletaria, the set design and mood they establish for all of these games do so much more to create a narrative than any amount of dialogue or character interaction can. In a genre famed for information dumps (i.e. providing a seemingly inordinate amount of information to a person who should be a part of that world already and thus aware of all of those things), From Software just turns this idea on its’ head entirely and makes the story something crafted within the players mind, with gentle suggestions and subtle pushes from the developers side. 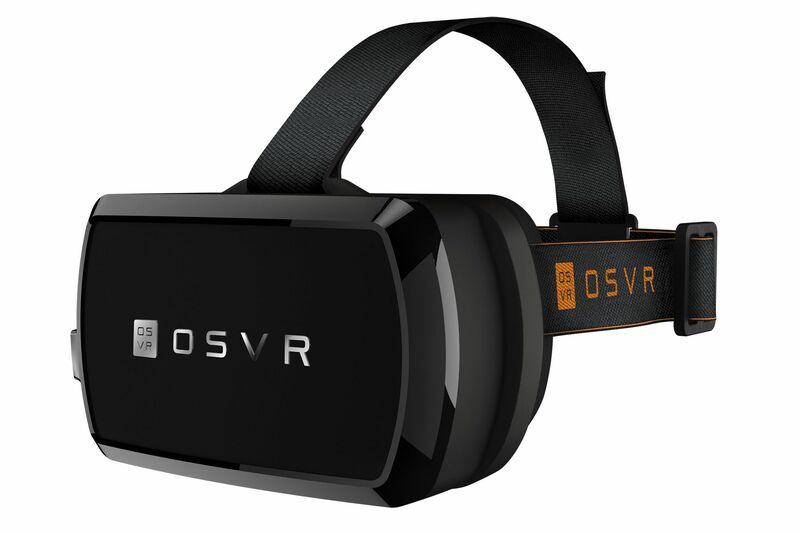 This does SO MUCH for immersion I cannot begin to tell you the effect it has unless you play these games. Playing a Dark Souls game is truly terrifying and exploratory in every sense of it, because of the lack of knowledge of what is going to happen every time you turn a corner, as well as the tension and suspense that is established by creating a world that is just so dark and out of place in relation to other fantasy worlds we have to expect. I could go on and on with this, but seriously, get your hands on this game if you haven’t already. What these games sometimes lack in gameplay and intricacy, they more than make up for in their absolutely insane quality in environment and set design. The Bioshock games are famed for being very story driven, intense experiences that put you in the middle of a story that grips you from start to finish. The reason I believe they have so much success in immersing the players in these stories is, much like Dark Souls, the worlds they create are so utterly different, expansive, and convincing that the player has no choice except to be caught up in events as they go along. Seriously, just look at the first shot of Rapture at the beginning of Bioshock 1. This is a scene that deserves to go down in history as a true work of art. It is just so intriguing to the player that they cannot help but wonder what it is exactly that is going on in this strange and wondrous city, and so the stage is set to hook the player into the dark world that lies underneath all of it. Add to this a very compelling and detailed storyline with very well fleshed out characters that have believable motivations and reasons for their actions (at least from their viewpoint) and you have all the elements for success. Something that I always found very intriguing about Bioshock games is their tendency to explore social structures and systems that revolved around anarchy and individualism as opposed to authoritarian ones. Thank you for reading, and I hope you find it informative! Oh Super pro tip : Watch the webseries Extra Credits. They’ll teach you more about game design boiled down to its integral elements by examining popular video games and their effects on players. Much of what I know about game design is from them. It’s been a good long while since I’ve last posted, but I’ve been incredibly busy with college. Have my finals going on right now, almost done with my bachelor degree in computer science. If you’re willing to read it to the end, this post will teach you how to create this sort of terrain using C++. I’m aware that there are programs that can achieve the same result available for free such as L3DT (which is actually used in this project), which are much better than this humble program and much more convenient to use, but I’d like to imagine that this simplifies the process of procedural terrain generation a little bit by reducing the complexity required to understand how to operate L3DT. If anyone is a beginner like me to the topic of procedural generation, perhaps this will be of help to them as well. This is a simple console program that allows the user to create heightmaps. A heightmap is a file that can store surface elevation values, which is a complicated way of saying it stores height information. 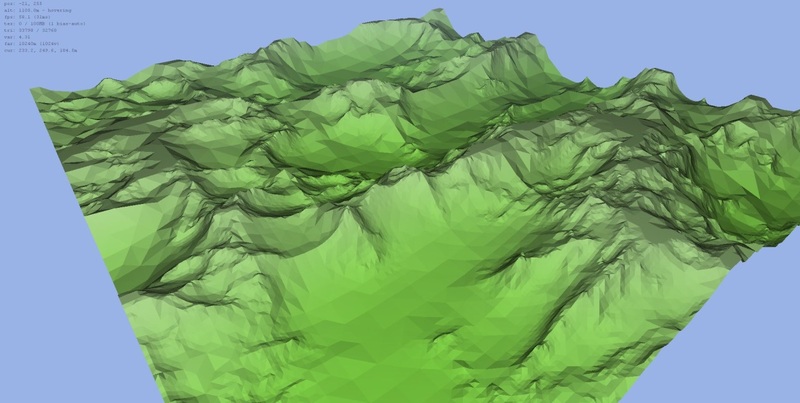 This height information can be used to model terrain in 3D game engines and some 3D modelling software. 1) Perlin Noise: A nifty algorithm created by Ken Perlin, this allows for the creation of noise that has a natural, organic and non repetitive appearance, which gives it a resemblance to a variety of natural objects such as clouds, fire, and terrain. 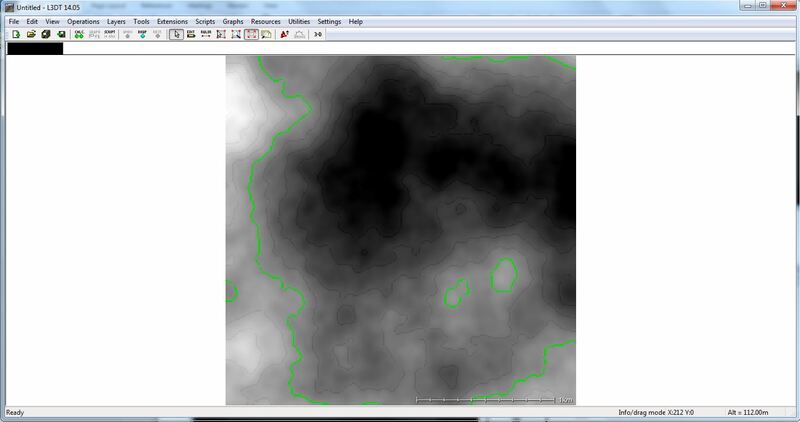 This means Perlin noise textures can be used as heightmaps. I have used the excellent open source library Libnoise to implement Perlin noise. https://mrl.nyu.edu/~perlin/ : Website of Ken Perlin. 2) Machine Learning: A method used to impart pseudo-artificial intelligence to the program by allowing it to take in input (feedback of user) which alters the output. Every iteration of feedback input improves the results of the previous stage. It does this by identifying a favorable content category and constraining future output to that category. 3) Exporting the heightmap as a Photoshop RAW file: Using the amazing tool L3DT(Large 3D Terrain Generator) to view the output of the terrain generation, user can decide if it matches their needs. User is presented with option to finalize output, modify it some way (more mountainous, flatter, hillier), or accept the output but request a refinement. When they choose to finalize, the heightmap is converted to Photoshop RAW format (again using a script in L3DT, all credit to Aaron Bundy). This RAW file can be imported into Unreal, Unity i.e. level design softwares. Apart from the above, I’ve also used the SFML libraries to create the GUI that displays the noise texture for user approval. So in order to make this work, you’d have to integrate the libnoise and SFML libraries into your project environment to successfully compile the source code given below. Above are pictures of a Perlin noise texture generated by the program. Once the heightmap has reached the satisfaction of the user, it can be exported in Photoshop RAW format, upon which it can then be imported into game engines like Unreal and Unity to be used to create terrain. This is a student made project and it’s bound to have some bugs here and there, but I believe it is a good first foray into procedural generation, which is a topic I shall definitely be pursuing in the future. Run Length Encoding is a method of data compression which involves reducing the length of the encoded data by replacing repeated elements in the data sequence with a shorter representation in order to save space. Notice that the numbers after each alphabet in the output string denote the number of repeated alphabets in the input string sequence. This is Run Length Encoding. I decided to write this program after a friend challenged me to see if I had the testicular fortitude at coding. String str = new String(); // String variable to hold the value of the string to be encoded. String rlestr = new String(); // String variable to hold the final RLE encoded string. Integer rlecount = 1, totalcount = 1; // The integers holding the RLE values and the value of the currently under analysis string variable. String ch = new String(); // Holds the value of the character in the run. if( str.charAt(i) == str.charAt(i+1) ) // Checks whether two consecutive letters are equivalent, hereby creating a run. if ( !Character.toString(str.charAt(i+1)).equalsIgnoreCase(ch) ) // Checks when the end of the run occurs and appends to the output string. if ( i == str.length() - 2 ) // When the end of the input string approaches, it performs the final append operation and breaks out of the loop.